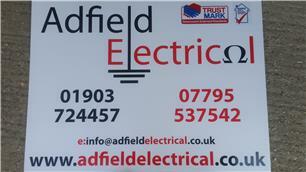 Adfield Electrical - Electrician based in Littlehampton, West Sussex. is a reliable and trustworthy company and undertakes all electrical work. All work carried out is to a high standard and is guaranteed. We are based in the Littlehampton area of west Sussex. We cover all of Sussex and even further if requested. Adfield Electrical has over 18 years electrical experience in all areas of electrical work, working in domestic, commercial and industrial premises. We offer free estimates and will quote for any large or minor works.We are also part p registered which enables us to notify any works to local authorities. We are also members of Napit.